Are You Giving A Safe Wax? You’ve heard the horror stories: a woman is badly injured during a Brazilian wax in suburban Chicago. According to a suit filed in Cook County, Christine Shaurette-Safy says she suffered “tearing and scarring” to her vaginal area during a 2009 wax treatment. The suit claims the spa let unskilled people apply the wax and failed to warn Saurette-Safy of the risks. An Irish model was permanently scarred when she was scalded during an eyebrow wax. Tara Murphy, in her 2006 lawsuit, says her eyebrows and the bridge of her nose were bleeding after the treatment. Her vision became blurred and she vomited as she left the salon. After this incident she lost modeling jobs because of the scarring to her face. And in Denver, Colorado Leann Bilodeau went to a spa for a lip wax. When the clinician pulled the wax off, layers of skin came off as well. Bilodeau says she has spent more that $1,000 to fix the scars on her face. Before you start taking clients make sure you have appropriate training. If your school only trained with soft strip wax, take a class on using hard waxes before you attempt them on a client. Likewise if they only trained face waxing, take hands-on training for the areas you want to offer services in. Every client should fill out a client intake form. It will have medical and lifestyle questions, including a list of medications the client takes. You may know that retin-a, coumadin and Accutane make the client an unsafe waxing candidate. But if you are not familiar with other drugs they list, have a good drug reference book available, or check them on web.md. Your clients will be impressed with your concern. Return clients should be checked every time for any changes to their medications, health or sun exposure. To protect yourself, have them initial a form that there have been no changes. Antibiotics can be problematic in that they can cause the skin to be more reactive, cause rashes, redness and itching. 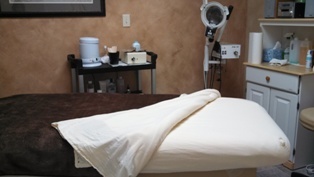 Make sure the treatment room looks freshly cleaned and tidy before each client. Be sure all counters and items that are touched have been cleaned and disinfected. Always disinfect your hands (or wash them, where your client can see you. 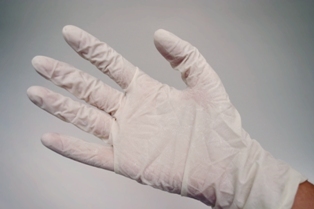 Make sure adequate supplies are available and put on disposable gloves before beginning the treatment. If you need additional supplies, gloves should be removed, supplies gathered and fresh gloves put on. The area to be waxed should be cleaned with a disinfecting solution, such as the Cirepil Blue lotion. It is gentle to the skin, but removes surface bacteria. This is important to reduce the risk of post-wax rash, which is actually a mild infection. To prevent burns test the wax on your own skin first and adjust the temperature if needed. The waxes we offer are designed to be used at low temperature so for optimum results make sure they are not too hot. The true test of safe, sanitary practice: always use disposable spatulas and do not reuse them. Think of the wax pot as the bowl of ranch dip on the buffet table at a party…Never double dip! When waxing is complete again disinfect the skin with a product like Cirepil Blue lotion and apply a post wax soothing product such as the Perron Rigot After Waxing Gel or Moisturizing Lotion. If you follow these are the protocols at your salon….relax, breathe easy and prepare for happy satisfied customers. High standards of safety and disinfection are now a significant selling point in the skin care industry.